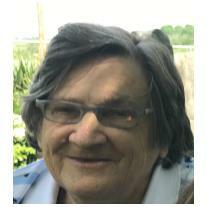 Mary Z. Epperson, 80, of Georgetown, formerly of Cynthiana, died Thursday, November 16, 2017 at her residence. She was born in Harrison County, KY, January 19, 1937, a daughter of the late William and Cora Lane Morrison Wiggins. Mary enjoyed bingo, the Red Mile Casino and had worked at Mallard Pen and Pencil, Hansley Mills and she was a farmer. She was preceded in death by her husband Kenneth Ray Epperson, two children, Danny Ray and Marcella Renee&apos; Epperson, son in law, Claude Allen Jenkins, siblings, Sarah, Velos, Betty, Billy, Homer, Lizzie, Sammy, Marion and Pearlie Wiggins. Survivors include one son, Kenneth Lee (Amanda) Epperson, four daughters, Juanita Faye Epperson Jenkins, Joyce Epperson (Mike) Gibson, Rita Epperson (Darrell) Middleton, Mary Sue Epperson, one brother, John T. (Sherry) Wiggins, grandchildren, Jo Ann McFarland Jonczy, Andrea Lynn Gibson Hutchison, Kelli Michelle Gibson Doyle, Heather Nicole Gibson Royalty, Kenna Ray Epperson Lay, David Michael Withrow, Kenneth Ray Epperson, 10 great grandchildren and a special nephew, Justin Sanders. Funeral services will be 1:00 PM, Tuesday, November 20, 2017, at the Drake-Whaley-McCarty Funeral Home, officiated by Rev. Rick Snyder. Friends may call from 5-8 PM Monday at the funeral home, burial will be in the Robinson Cemetery. Memorial contributions may be made to Bluegrass Care Navigators or to the funeral home toward funeral expenses. Pallbearers: Michael Withrow, Justin Sanders, Jacob Wagoner, Austin Sumpter, Mike Gibson, Darrell Middleton, and Fred Morris. Her faithful companion, Marley Sue Epperson will serve as an honorary pallbearer.